The main purpose of the charts is to display data in a graphical form. However, ChartArea control exposes numerous events, that allow you to make your charts more interactive. ItemClick - occurs when the user clicks on a series item, for example a bar or a candle. ItemToolTipClosing and ItemToolTipOpening - use to customize the ToolTip behavior. For more, see ToolTips. 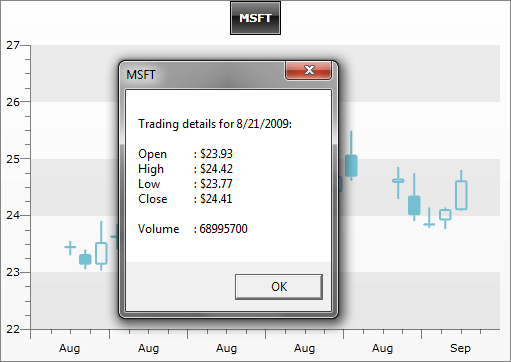 The example below shows a text box with some details when a candle is clicked. ItemClick event is also used to implement drill-down charts. On the snapshot below you can see the MessageBox shown when the user has clicked on a candle. The formatted text message takes detailed information from the underlying business object, which is accessible through the ChartItemClickEventArgs.DataPoint.DataItem. There are two main methods, which handle the selection. The first one is: Chart1.DefaultView.ChartArea.SelectItem - this method has a few overloads, but in general accepts a datapoint, or an index pointing to a specific datapoint in the chart series. The Chart1.DefaultView.ChartArea.SelectItems method allows the selection of multiple datapoints, which are specified through the parameters.